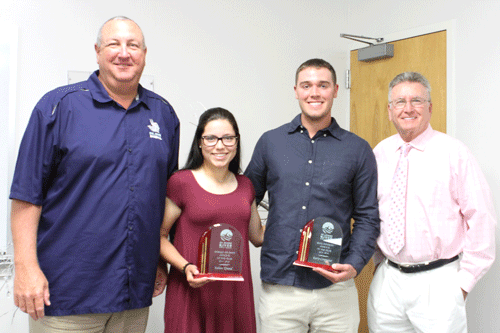 St. Johns River State College recently announced its student athletes of the year during the College’s annual President’s Circle event. In a room filled with students and President’s Circle donors, Athletic Director Ross Jones announced softball player Kelsea Friend as the female Student Athlete of the Year and baseball player Kerry Carpenter as the male Student Athlete of the Year. Friend, a freshman from Boca Raton, was an All Mid-Florida Conference second team selection this year, splitting her time between left field and center. She was the lead-off hitter for most the year, ending the season with a .355 batting average, including 49 hits, 30 runs, 12 RBIs and 19 stolen bases. Friend has a 3.71 GPA and aspires to become a physical therapist. Carpenter, a sophomore right fielder from Eustis, will head to Virginia Tech this fall, where he will major in finance. As a freshman, Carpenter was an All Mid-Florida Conference second team selection and an NJCAA Academic All-American. With a broken hand, he batted .330, with eight doubles, four home runs and 34 RBIs for the season. Carpenter led the state of Florida during his sophomore year with a .433 batting average, including 51 runs on 84 hits, with 19 doubles and a triple, and was tied for second in the state with 14 home runs. Additionally, he had 10 stolen bases and was second in the state with 56 RBIs for the season. Carpenter was an All Mid-Florida Conference first team and an All-State team selection this season and was recently named an NJCAA Academic All-American for 2018. He received the 2018 John C. Tindall Endowed Scholarship earlier this season for his exemplary work ethic, leadership and performance both on the field and in the classroom. “Kerry’s had a remarkable career here,” said Jones, adding that he has maintained a 4.0 GPA, scoring only one B throughout his SJR State career. SJR State athletics consist of women’s volleyball, women’s fastpitch softball, and men’s baseball and are based on the Palatka campus. For more information regarding SJR State athletics, visit SJRvikings.com. SJR State announces the year’s top student-athletes. From left, Athletic Director and Head Baseball Coach Ross Jones, Kelsea Friend, Kerry Carpenter and Assistant Athletic Director John R. Theobold.